Miles’s actions are clearly a source of frustration for his teachers. Although teachers will want to evaluate whether they are planning activities that require children to sit for an extended time and ensure that the activities they offer children are active and meaningful, it is also important for teachers to understand how to support children who exhibit challenging behavior. Challenging behavior is defined as “any repeated pattern of behavior, or perception of behavior, that interferes with or is at risk of interfering with optimal learning or engagement in prosocial interactions with peers and adults” (Powell, Dunlap, & Fox 2006, 26). Challenging behavior can signal difficulty with social and emotional adjustment—foundational competencies that are linked to children’s school readiness and later school success (Fantuzzo et al. 2007). Although challenging behavior can occur in any classroom, research indicates that some children in urban communities experience conditions that contribute to risk factors for social and emotional delays (Fox, Dunlap, & Powell 2002). In addition, there is a specific need to support children who live in poverty, as children in poor families are twice as likely to be at risk for developmental, behavioral, and social delays as children in families earning 200 percent or more of the federal poverty line (Children’s Defense Fund 2014). That is, while 10–21 percent of all preschool children show challenging behaviors such as aggression, noncompliance, defiance, tantrums, and property destruction, 30 percent of children who live in poverty exhibit such behaviors (Voorhees et al. 2013). In this article we describe five culturally responsive core strategies to promote positive teacher relationships with young children in preschool and minimize challenging behavior: learn about children and families, develop and teach expectations, take the child’s perspective, teach and model empathy, and use group times to discuss conflict. 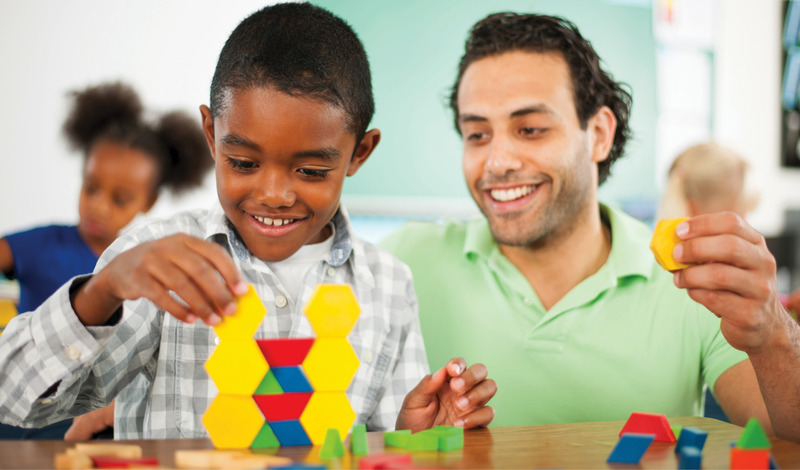 As African American boys experience a much higher rate of suspensions and expulsions from preschool settings than do other children (Gilliam 2005), these relationship-building techniques are particularly relevant for teachers as they reflect on their own practices and biases—especially toward African American boys—in early childhood classrooms. A core consideration in developmentally appropriate practice and cultural responsiveness is that practitioners learn about each child and family and intentionally adapt and respond to each child’s strengths and needs (Copple & Bredekamp 2009; Derman-Sparks & Edwards 2009). Culturally responsive practice is often defined as using the experiences and perspectives of children and their families as a tool to support them more effectively (Gay 2002). As this approach is child and family centered, it sets the stage for critical relationship building (Ford & Kea 2009). Teachers can partner with families by inviting them to visit the classroom and participate in activities with their child. Teachers can also arrange to visit children at home, where they may engage in informal discussions with family members about what children enjoy doing for fun and learn about their favorite food, toy, or song. These interactions can reveal cultural values and norms in the home environment. Families may also share information about their child’s temperament, primary play partners, and home language (NAEYC 1995). Meetings at school with families might address family routines, religious holidays and traditions, and activities the families enjoy in the community. Teachers can use information they learn about a child and family to support the child’s social and emotional adjustment to the early childhood environment. Further, these conversations can demonstrate that not all children and families within a particular racial or ethnic group display similar characteristics, which is a potential teacher bias (Ford & Kea 2009). Sharing a short, warm anecdote with families, in person or in a note, about something their child did that day assures parents that the teacher cares about their child and makes an effort to know the child individually. This further connects families to their child’s classroom community. During a recent conversation with Miles’s mother, Mrs. Green learned that Miles’s father is a musician and that Miles really enjoys music. Miles’s mother explained that Miles likes to dance and sing to his favorite songs, moving vigorously around the house. Mrs. Green used her knowledge about Miles’s interest to plan music and movement activities for future morning circles to engage Miles. The five core strategies we suggest are informed by fundamental principles of the pyramid model (Fox & Hemmeter 2009)­—a comprehensive framework for addressing the social and emotional outcomes of young children (Hemmeter, Ostrosky, & Fox 2006). The pyramid model includes three levels of support: universal prevention strategies for use with all children; secondary social and emotional approaches for children at risk for social and emotional delays; and tertiary individualized and function-based interventions for children with persistent challenges (Fox & Hemmeter 2009). Expectations need to be consistently emphasized to prevent challenging behavior. In addition to responding to opportunities that arise during the day, teachers decide how and when they will teach, model, and positively reinforce the expectations across environments (circle time, music and movement activities, recess, lunch/snack) so that the guidelines and associated behaviors become part of the program culture (Benedict, Horner, & Squires 2007). Many teachers develop songs and hand movements to go with their expectations. Other approaches include modeling, using puppets, reading stories, and role-playing. Pictures of the children, teachers, and staff demonstrating the expectations can be posted in classrooms and common areas for further encouragement. To reinforce positive behavior and to bring the actions to children’s attention, it is important to verbally acknowledge children and adults when they demonstrate expectations. When a child’s behavior reflects a great example of an expectation such as “Be a Friend”—like helping another child clean up a spill at lunch or inviting a new child to build a block tower—teachers can write a note of thanks or give the child an opportunity to wear a “Super Friend” cape. A bulletin board in a common area provides a public place to post notecards recognizing adults who demonstrate examples of meeting program expectations (“Miss Wilma was a helper today when she fixed Erin’s hearing device!”). To be culturally responsive, it is important that expectations reflect the values and cultures of families and teachers and other staff in the school. For example, in the African American culture, in which community is valued over independence (Ford & Kea 2009), guidelines for some activities (like snack) may emphasize relationship-building behaviors—passing the food bowl—over independent adaptive skills—taking an appropriate portion of a self-serve snack. Another culturally responsive strategy for supporting positive relationships is empathy—concern for others arising from an emotional connection. Empathetic individuals apply interpersonal sensitivity to understand the experiences of others in order to provide support or assistance (Berliner & Materson 2015). Researchers have long theorized that empathy is a critical component in teacher effectiveness in urban settings, positively impacting teachers’ dispositions in interactions with students of color (Warren 2014). Thus, it is important for teachers in urban settings to model and encourage empathy to foster a culturally responsive classroom environment. To develop and teach empathy, teachers first have to know themselves (Derman-Sparks & Edwards 2009). It is necessary for teachers to engage in critical self-reflection to uncover implicit personal biases and assumptions, and bridge understanding across cultural groups (Cooper, He, & Levin 2011; Price 2015). Whether subconscious or explicit, teachers’ negative perceptions about children who differ from them in terms of culture, race, or ethnic identity can impact the teachers’ ability to teach effectively and create empathetic classrooms. Teachers can help children learn empathetic behavior by modeling warm and responsive actions, like anticipating and responding promptly to children’s needs and worries, and greeting children with a smile (Twardosz 2005). Using storybooks, games, and music is another way to teach empathy. Teachers can create lessons and activities that highlight respect, kindness, compassion, and responsibility—and help children discover similarities with peers from different backgrounds (Berliner & Materson 2015). Teachers can ponder reflective questions, such as, What are my initial reactions to this child and her family?, What do my reactions tell me about my personal beliefs and assumptions?, and What can I do to build the child’s and family’s trust? (Collins, Arthur, & Wong-Wylie 2010; Price 2015). Although there is work to be done to unpack the contextual factors that may explain why African American boys are expelled and suspended at a higher rate than other preschool children, self-reflective questions like these and those offered throughout Anti-Bias Education for Young Children and Ourselves (Derman Sparks & Edwards 2009) are one place to start. It is necessary for teachers to engage in critical self-reflection to uncover implicit personal biases and assumptions. Historically, picture books have featured mostly white characters (Larrick 1965). When choosing high-quality books for the classroom, make sure that the characters reflect the ethnic makeup of your classroom (Larrick 1965; Koss 2014), as it is important for all children, and particularly those of color, to “see themselves” in books. During these lessons, teachers can teach relevant emotion vocabulary (Joseph, Strain, & Ostrosky 2008), read books, and sing songs that reflect the children’s cultures. According to the tenets of Afrocentric teaching—which harnesses the skills African American children bring to schools to engage them in the classroom experience (Ford & Kea 2009)—combining music with creative movement, mime, and dance is a form of expression for many African American children and engages them in shared affective experiences that are useful for empathy development (Boykin 1994; Laird 2015). For example, in a jubilant rendition, Miles and Carmen share a toy drum and a tambourine as they dance to a popular song heard in their communities. The song promotes unity, friendship, and love. Through group music making, children can express feelings and connect with the feelings of others, promoting positive social and emotional development. The final culturally responsive strategy drawing from the pyramid model framework is using group time to resolve conflict. This allows for a restorative justice approach, which offers those involved in the conflict an opportunity for reconciliation. Although many children benefit from the use of group time to address conflict and this approach can promote inclusion, as opposed to exclusion (e.g., time out), as a response to challenging behavior, it is important to develop methods and awareness so children do not feel shamed during the process but rather part of a trusting community of problem solvers. When done well, problem solving as a group can foster active engagement and learning and enable children and adults to build strong relationships. The teacher can establish the tone for the group by reading a poem about friendship or sharing a culturally relevant and familiar quote from a song, movie, or book. Next, it is helpful to remind children of the expectations for the discussion: “We’ve been practicing how to listen and how to talk at group time. Let’s remember to wait calmly for our turn to speak, make eye contact with the person to whom we’re talking, and use kind words.” In some cases, teachers can minimize challenging behavior by conducting group time prior to situations with potential for challenging behavior (before a field trip, in the beginning of the school year, prior to implementing a change to the environment) (Costello, Wachtel, & Wachtel 2009; Pautz 2009). Young children with challenging behavior are often rejected by their peers and receive less positive feedback from teachers than their peers do (Hemmeter, Ostrosky, & Fox 2006). Early childhood classrooms are a primary setting for teaching skills that are critical for young children’s social and emotional development. Given the large amount of time many children spend in these settings, it is important that strong, positive teacher–child relationships be nurtured to ensure that children receive the support needed to promote positive social and emotional development (Bronfenbrenner 1977) and school readiness in general (Williford et al. 2013). Practitioners in urban settings play a valuable role in young children’s social and emotional development by providing supports that are relevant and appropriate. The five culturally responsive strategies described in this article can guide teachers in creating a classroom atmosphere that not only responds to children’s challenging behaviors but also anticipates their needs. Implementation of these strategies helps teachers initiate sustainable relationships and nurturing classrooms where all children are valued and have opportunities to grow and develop. The more children get together and engage in prosocial interactions with teachers and peers, the happier everyone will truly be. Benedict, E.A., R.H. Horner, & J.K. Squires. 2007. “Assessment and Implementation of Positive Behavior Support in Preschools.” Topics in Early Childhood Special Education 27 (3): 174–92. Berliner, R., & T.L. Masterson. 2015. “Review of the Research: Promoting Empathy Development in the Early Childhood and Elementary Classroom.” Childhood Education 91 (1): 57–64. Boykin, A.W. 1994. “Afrocultural Expression and Its Implications for Schooling.” In Teaching Diverse Populations: Formulating a Knowledge Base, eds. E.R. Hollins, J.E. King, & W.C. Hayman, 243–56. Albany: State University of New York Press. Bronfenbrenner, U. 1977. “Toward an Experimental Ecology of Human Development.” American Psychologist 32 (7): 515–31. Children’s Defense Fund. 2014. The State of America’s Children. Washington, DC: Children’s Defense Fund. www.childrensdefense.org/library/state-of-americas-children/2014-soac.pdf. Collins, S., N. Arthur, & G. Wong-Wylie. 2010. “Enhancing Reflective Practice in Multicultural Counseling Through Cultural Auditing.” Journal of Counseling and Development 88 (3): 340–47. Cooper, J.E., Y. He, & B.B. Levin. 2011. Developing Critical Cultural Competence: A Guide for 21st Century Educators. Thousand Oaks, CA: Sage. Copple, C., & S. Bredekamp, eds. 2009. Developmentally Appropriate Practice in Early Childhood Programs Serving Children From Birth Through Age 8. 3rd ed. Washington, DC: National Association for the Education of Young Children. Costello, B., J. Wachtel, & T. Wachtel. 2009. The Restorative Practices Handbook for Teachers, Disciplinarians, and Administrators. Bethlehem, PA: International Institute for Restorative Practices. DeBernardis, G.M., L.J. Hayes, & M.J. Fryling. 2014. “Perspective Taking as a Continuum.” Psychological Record 64 (1): 123–31. Derman-Sparks, L., & J.O. Edwards. 2009. Anti-Bias Education for Young Children and Ourselves. Washington, DC: National Association for the Education of Young Children. Dixon, H. 2016. “Making Peace in Kindergarten: Social and Emotional Growth for All Learners.” Young Children 71 (4): 57–66. www.naeyc.org/yc/pastissues. Fantuzzo, J., R. Bulotsky-Shearer, P. McDermott, C. McWayne, D. Frye, & S. Perlman. 2007. “Investigation of Dimensions of Social-Emotional Classroom Behavior and School Readiness for Low-Income Urban Preschool Children.” School Psychology Review 36 (1): 44–62. Ford , D.Y., & C.D. Kea. 2009. “Creating Culturally Responsive Instruction: For Students’ and Teachers’ Sakes.” Focus on Exceptional Children 41 (9): 1–16. Fox, L., G. Dunlap, & D. Powell. 2002. “Young Children With Challenging Behavior: Issues and Considerations for Behavior Support.” Journal of Positive Behavior Interventions 4 (4): 208–17. Fox, L., & M.L. Hemmeter. 2009. “A Program-Wide Model for Supporting Social Emotional Development and Addressing Challenging Behavior in Early Childhood Settings.” In Handbook of Positive Behavior Support, eds. W. Sailor, G. Dunlap, G. Sugai, & R. Horner, 177–202. New York: Springer. Gay, G. 2002. “Preparing for Culturally Responsive Teaching.” Journal of Teacher Education 53 (2): 106–16. Gilliam, W.S. 2005. Prekindergartners Left Behind: Expulsion Rates in the State in Prekindergarten Programs. New Haven, CT: Yale University Child Study Center. Hemmeter, M.L., M.M. Ostrosky, & L. Fox. 2006. “Social and Emotional Foundations for Early Learning: A Conceptual Model for Intervention.” School Psychology Review 35 (4): 583–601. Joseph, G., P. Strain, & M.M. Ostrosky. 2008. Fostering Emotional Literacy in Young Children: Labeling Emotions. What Works Brief #21. Champaign, IL: Center on the Social and Emotional Foundations of Learning. http://csefel.vanderbilt.edu/kits/wwbtk21.pdf. Koss, M. 2014. “Diversity in Contemporary Picture Books: A Content Analysis.” Journal of Children’s Literature 41 (1): 32–42. Laird, L. 2015. “Empathy in the Classroom: Can Music Bring Us More in Tune With One Another?” Music Educators Journal 101 (4): 56–61. Larrick, N. 1965. “The All-White World of Children’s Books.” Saturday Review (1): 63–65. NAEYC (National Association for the Education of Young Children). 1995. “Responding to Linguistic and Cultural Diversity. Recommendations for Effective Early Childhood Education.” Position statement. Washington DC: NAEYC. https://www.naeyc.org/files/naeyc/file/positions/PSDIV98.PDF. Pautz, M.-I. 2009. “Empowering the Next Generation: Restorative Practices in a Preschool.” Restorative Practices EForum. www.iirp.edu/iirpWebsites/web/uploads/article_pdfs/93908_rp_preschool.pdf. Powell, D., G. Dunlap, & L. Fox. 2006. “Prevention and Intervention for the Challenging Behaviors of Toddlers and Preschoolers.” Infants and Young Children 19 (1): 25–35. Price, C. 2015. “Reflective Questions for Early Interventionists and Early Childhood Special Educators.” Presentation at the Annual International Conference of the Division for Early Childhood of the Council for Exceptional Children, in Atlanta, Georgia. Steed, E.A., & T. Pomerleau. 2012. Preschool-Wide Evaluation Tool (PreSet) Manual, Research Edition: Assessing Universal Program-Wide Positive Behavior Support in Early Childhood. Baltimore, MD: Brookes. Twardosz, S. 2005. Expressing Warmth and Affection to Children. What Works Brief #20. Nashville, TN: Center on the Social and Emotional Foundations for Early Learning. http://csefel.vanderbilt.edu/briefs/wwb20.pdf. Voorhees, M.D., L.V. Walker, M.E. Snell, & C.G. Smith. 2013. “A Demonstration of Individualized Positive Behavior Support Interventions by Head Start Staff to Address Children’s Challenging Behavior.” Research and Practice for Persons With Severe Disabilities 38 (3): 173–85. Warren, C.A. 2014. “Towards a Pedagogy for the Application of Empathy in Culturally Diverse Classrooms.” Urban Review 46 (3): 395–419. Williford, A.P., M.F. Maier, J.T. Downer, R.C. Pianta, & C. Howes. 2013. “Understanding How Children’s Engagement and Teachers’ Interactions Combine to Predict School Readiness.” Journal of Applied Developmental Psychology 34 (6): 299–309.